Just getting to the finish line is plenty to celebrate, but some theme races (we see you, BeerFit Running Series) are starting the party a little early. Running a 5K is a great way to spend a Sunday… and we don’t mind condoning a lazy afternoon spent with a few glasses of wine or beer. But before we combine these two seemingly opposite (and yet somehow equally enjoyable) activities, we wanted to do our homework. We know all those amazingly in-shape runners aren’t steering us wrong by running toward a winery, grabbing cups of red along the way — but is it seriously safe to run while boozing? Experts say the key is to drink in moderation and listen to your body. It’s best to stick to “mildly intoxicating levels,” says National Academy of Sports Medicine-certified trainer Vanessa Martin, founder of SIN workouts, who is careful to mention that she doesn’t condone the mix of alcohol and fitness as a whole. On the other hand, booze has beneficial effects in the body as long as we stick to those moderate levels. “Alcohol works as a vasodilator to relax and open up blood vessels. In turn, this is useful in transporting red blood cells to the muscles,” she says. Once you hit a certain threshold, however, the reverse effect occurs. “The blood vessels constrict, allowing less oxygenated blood to transport through the body, making work more difficult,” Martin says. Stick with a lower dose — the amount in question will depend on your body — to stay on the helpful size of alcohol’s effects. “Simply stated,” Martin says, “in my experience, alcohol can help take your mind off the 20-mile run you have to do for training.” Unfortunately, there’s no magic formula that will tell you how much to drink on race day. Listen to your body, and try trial and error before the big day to make sure you can handle alcohol on top of your physical activity. Carl Ewald, executive director of the ODDyssey Half Marathon, says small quantities of alcohol (think the cups at a water stop) can be beneficial late in a race when the body is craving simple calories. Naturally, he reminds us to keep alcohol content in mind, “especially after long-distance runs when you may already be significantly dehydrated and calorie deprived.” Martin and SIN lead run coach Vinnie Marino suggest noncarbonated beverages. 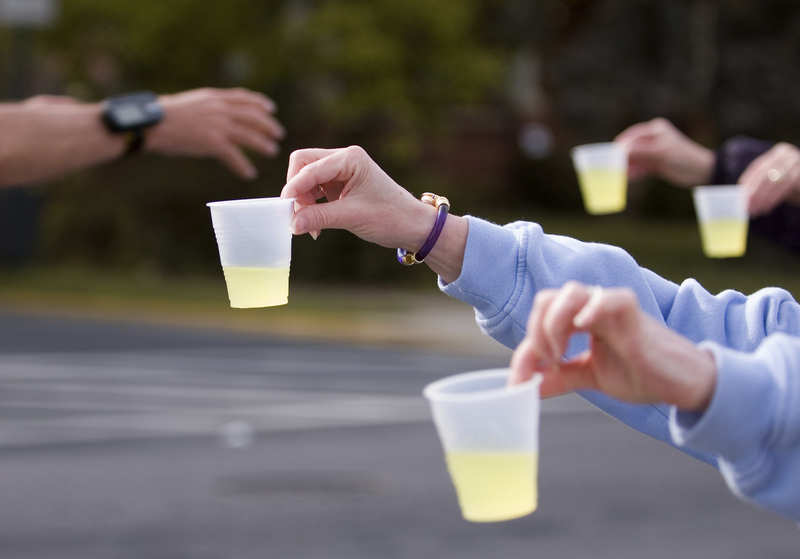 Regardless of how much alcohol enters your system, remember to keep drinking water throughout the race. According to physical therapist Kosta Kokolis, “There’s no magic number of how many cups of water to drink when consuming alcohol during a workout.” One thing to keep in mind is that you should up your water consumption when drinking (even if you’re not running!) and make sure to take two big gulps of water every 20 minutes of running. However you decide to drink and run, remember that any amount of alcohol can cause impaired judgment. Make sure you have a pal on hand to cheer you on and then to drive you home.